RSVP to let us know you're donating! There's no need to RSVP for anything - but if you want to let us know you're participating, please go ahead. 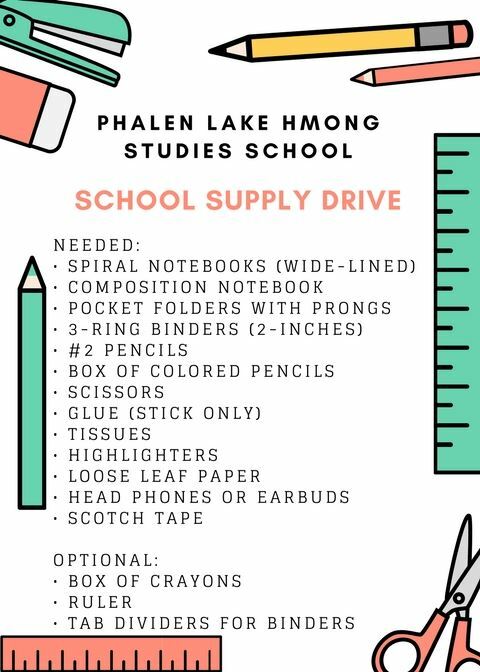 Please join MNAPABA's fourth annual school supply drive to benefit the Phalen Lake Hmong Studies School in St. Paul. The school offers students the opportunity to explore the culture, language, history, traditions, literature, and art of the Hmong community. Please bring your donations to the MNAPABA Annual Summer Party on August 13. Register here. Below is a list of suggested school supplies. All supplies are appreciated and will be warmly accepted.